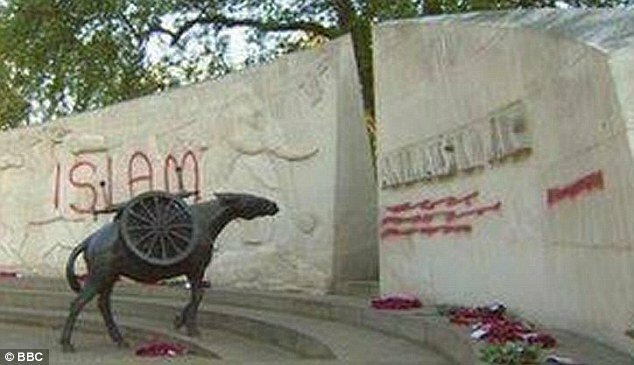 A British World War II war memorial was vandalized last night with “Islam” spray painted across it in bright red letters. Two of Britain’s most celebrated war memorials have been defaced, apparently with the word ‘Islam’ scrawled across them and inscriptions scrubbed out with red paint. Police have confirmed they are investigating the vandalism of the RAF Bomber Command Memorial in Green Park and the Animals In War Memorial in Park Lane, both in central London. Pictures taken today show that the damage has now been covered over with plastic or white sheets. Scotland Yard said there have not been any arrests, so it not clear if it has been done by Muslim protesters or far-right groups attempting to stir-up hatred. A spokesman for the Metropolitan Police said: ‘At 5am this morning police discovered graffiti on both the RAF Bomber Command War Memorial in Green Park and the Animals in War Memorial on Park Lane. The Bomber Command Memorial remembers the sacrifice and bravery of the 55,573 RAF crew who lost their lives in the Second World War and was unveiled by the Queen last summer. Just last week Dame Judi Dench described herself as being ‘very proud’ to be the first patron of a new campaign to preserve it for generations to come. The police were pretty quick to pin this on far right pro-British groups, huh? More… At 5am this morning police discovered graffiti on both the RAF Bomber Command War Memorial in Green Park and the Animals in War Memorial on Park Lane.